ხოლო ქუემო კერძო პარეხისა მის, რომელსა შინა იყოფებოდეს წმიდანი იგი, იყო სხუაჲ პარეხი, რომელსა შინა იყოფებოდა ვეშაპი დიდი და საზარელი, რომელსა ესხნეს თუალნი სისხლის ფერნი და რქაჲ იყო შუბლსა და ფაჩარი ფრიად ქედსა მისსა. Readers of this blog are undoubtedly aware of the recent reports of the destruction of the Monastery of Mar Behnam and Sara (see here, here, and elsewhere). The fate of the monastery’s manuscripts is now unknown. Not long ago, at least, HMML and the CNMO (Centre numérique des manuscrits orientaux) digitized the collection. A short-form catalog of these 500+ manuscripts has been prepared for HMML by Joshua Falconer, and I have taken a more detailed look at a select number of manuscripts in the collection. From this latter group I would like to highlight a few and share them with you. The texts mentioned below are biblical, hagiographic, apocryphal/parabiblical, historical, poetic, theological, medical, lexicographic, and grammatical. Here I merely give a few rough notes, nothing comprehensive, along with some images, but in any case the value and variety of these endangered manuscripts will, I hope, be obvious. These manuscripts, together with those of the whole collection, are available for viewing and study through HMML (details for access online and otherwise here). 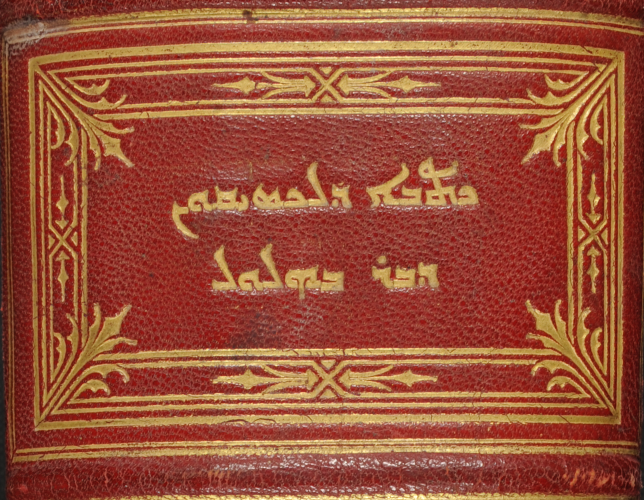 Syriac Pentateuch. Pages of old endpapers in Syriac, Garšūnī, and Arabic. Very many marginal comments deserving of further study to see how they fit within Syriac exegetical tradition. The comments are anchored to specific words in the text by signs such as +, x, ~, ÷. According to the original foliation, the first 31 folios are missing. 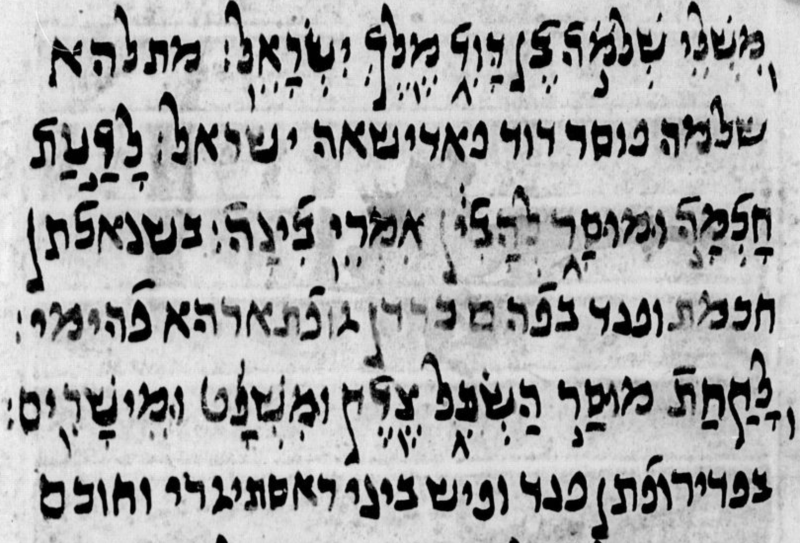 MBM 1, f. 105v, with marginal note to Ex 28:37, with the Greek letter form of the tetragrammaton. MBM 1, f. 275v, with marginal note on Dt 25:5 explaining ybm as a Hebrew word. Syriac texts on Mary and the young Jesus. Folio(s) missing, and the remaining text is somewhat disheveled. In addition, some pages are worn or otherwise damaged. Colophon on 79v, but incomplete. The Book of the Upbringing of Jesus, i.e. 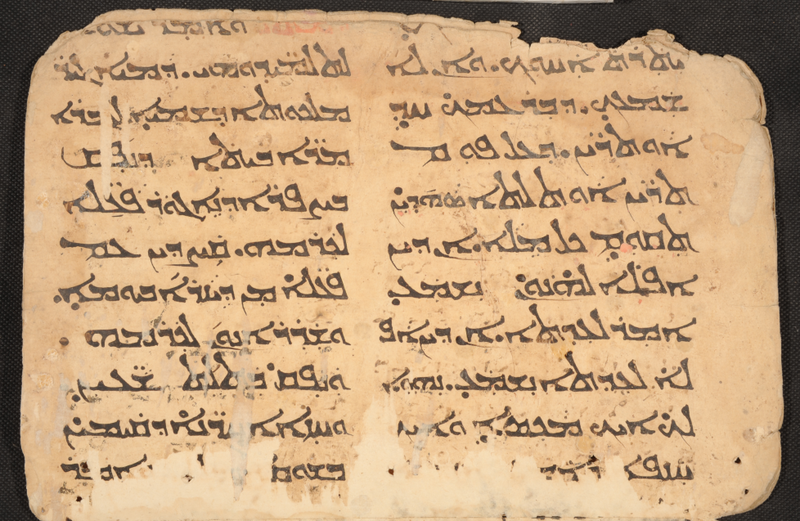 the Syriac Infancy Gospel, 1r-12v. Beg. miss. See the published text of Wright, Contributions to the Apocryphal Literature of the New Testament, pp. 11-16 (Syr), available here. The Six Books Dormition 13r-79r (beg and end miss?). See Wright, “The Departure of my Lady from this World,” Journal of Sacred Literature and Biblical Record 6 (1865): 417–48; 7: 110–60. (See also his Contributions to the Apocryphal Literature) and Agnes Smith Lewis, Apocrypha Syriaca, pp. 22-115 (Syr), 12-69 (ET); Arabic version, with LT,by Maximilian Enger, Ioannis Apostoli de transitu beatae Mariae Virginis liber (Elberfeld, 1854) available here. In this copy, the end of the second book is marked at 24v, and that of the fifth book on 30v. As indicated above, there are apparently some missing folios and disarranged text. MBM 20, f. 24v. End of bk 2, start of bk 3 of the Six Books. Another copy of Eliya of Nisibis, Book of the Translator, on which see my article in JSS 58 (2013): 297-322 (available here). Bar ʿEbrāyā’s Metrical Grammar. Colophon on 99r: copied in the monastery of Symeon the Stylite, Nisan (April) 22, at the ninth hour in the evening of Mar Gewargis in the year 1901 AG = 1590 CE. Bar ʿEbrāyā’s Metrical Grammar, d. 1492/3 on 78v. Clear script, but not very pretty. Bar ʿEbrāyā, Book of Rays. 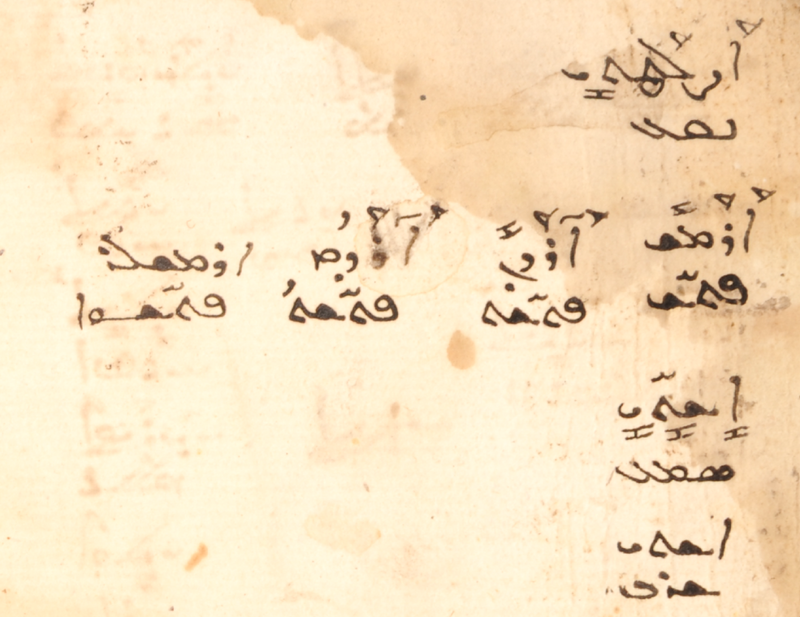 Lots of marginalia in Syriac, Arabic, and Garšūnī. Bar Bahlul’s Lexicon, 18th cent. Beg. miss. 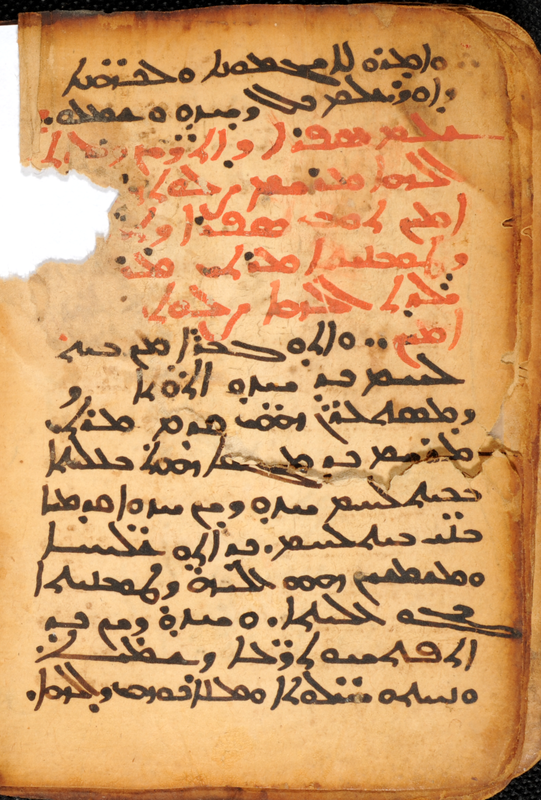 Some folios numbered by original scribe in the outer margin with Syriac letters, often decorated. Nice writing. 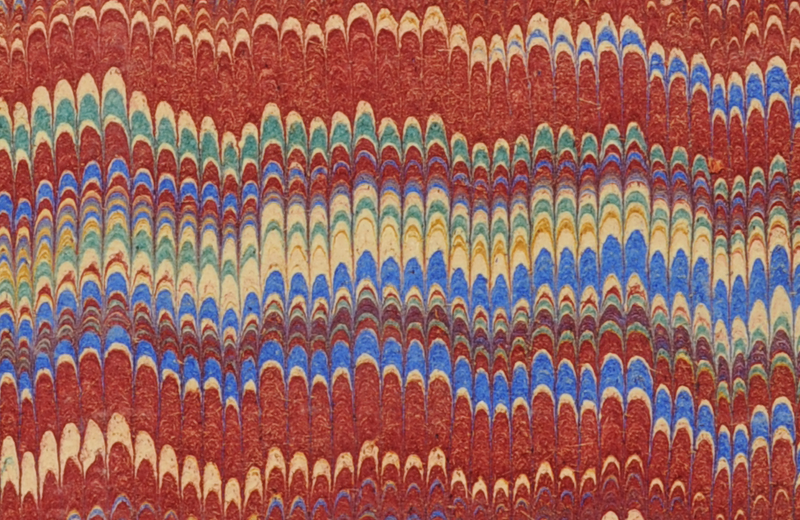 Beautiful marbled endpapers, impressed Syriac title on spine. The Six Books Dormition, Garšūnī, from books 5-6, 16th cent. (?). 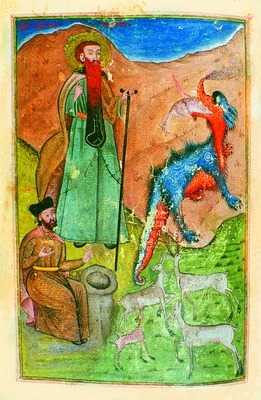 Hagiography, &c., Garšūnī, 16th/17th cent. According to the original foliation, the first eleven folios are missing from the manuscript. 1r end of the Protoevangelium Jacobi (for the corresponding Syriac part, cf. pp. 21-22 in Smith Lewis’s ed. here). Here called “The Second Book, the Birth”. 1r-31v Vision of Theophilus, here called “The Third Book, on the Flight to Egypt…” Cf. 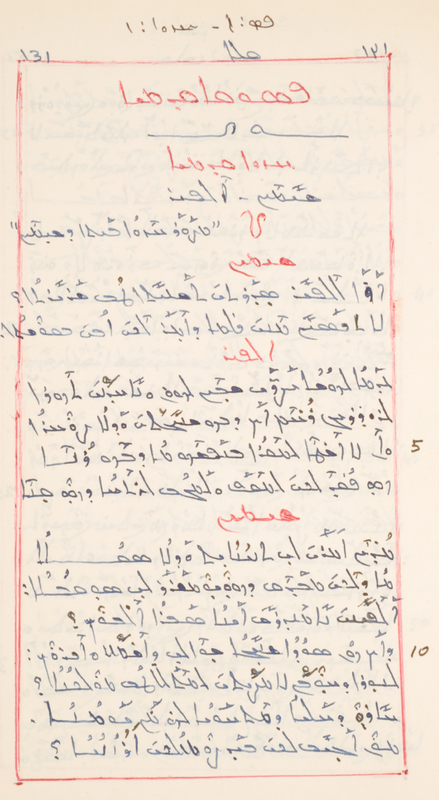 GCAL I 229-232; Syriac and Arabic in M. Guidi, in Rendiconti della Accademia dei Lincei, Classe di scienze morali, storiche e filologiche, 26 (1917): 381-469 (here); Syriac, with ET, here. 19th cent., Garšūnī, hagiography. Not very pretty writing, but includes some notable texts (not a complete list): Job the Righteous 3v, Jonah 14v, Story of the Three Friends 24r (? ), Joseph 73r, Ahiqar 154v, Solomon 180v, and at the end, another Sindbad text 197v-end (see the previous posts here and here). MBM 209, f. 197v. The Story of Hindbād and Sindbād the Sailor. Medical, very nice ES Garšūnī. Includes Ḥunayn’s Arabic translation of the Summary of Galen’s On the Kinds of Urine (fī aṣnāf al-bawl), ff. 1v-8r; cf. here. For a longer Greek text, see Kuehn, Claudii Galeni Opera Omnia (Leipzig, 1821-33), vol. 19, pp. 574-601. These now separate folios seem originally to have been the eighth quire of another codex. MBM 250, f. 1v. Beg. 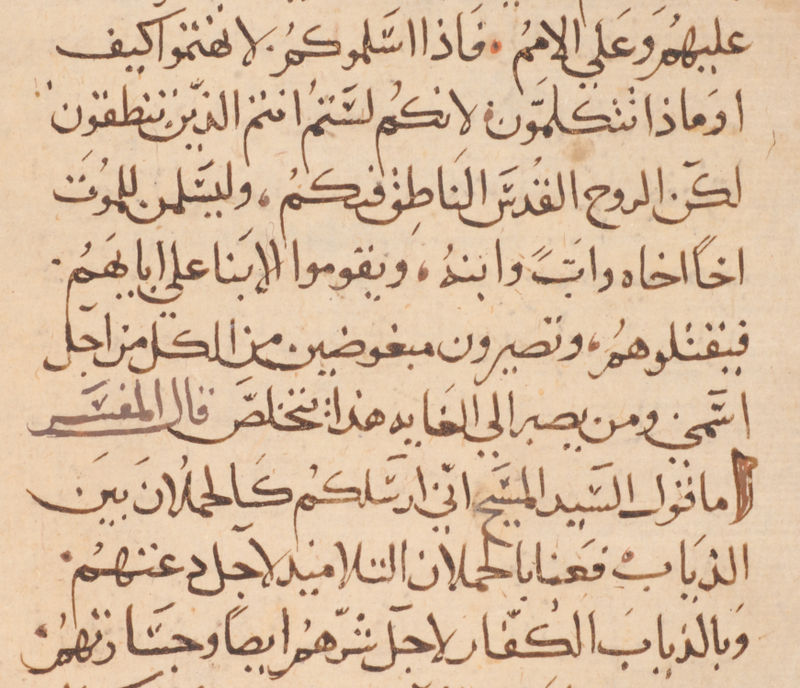 of Ḥunayn’s Arabic translation of the Summary of Galen’s On the Kinds of Urine. John of Damascus, De fide Orthodoxa, Arabic (cf. Graf, GCAL II, p. 57, this ms not listed). Fine writing. 16th/17th cent. MBM 270, f. 5v. 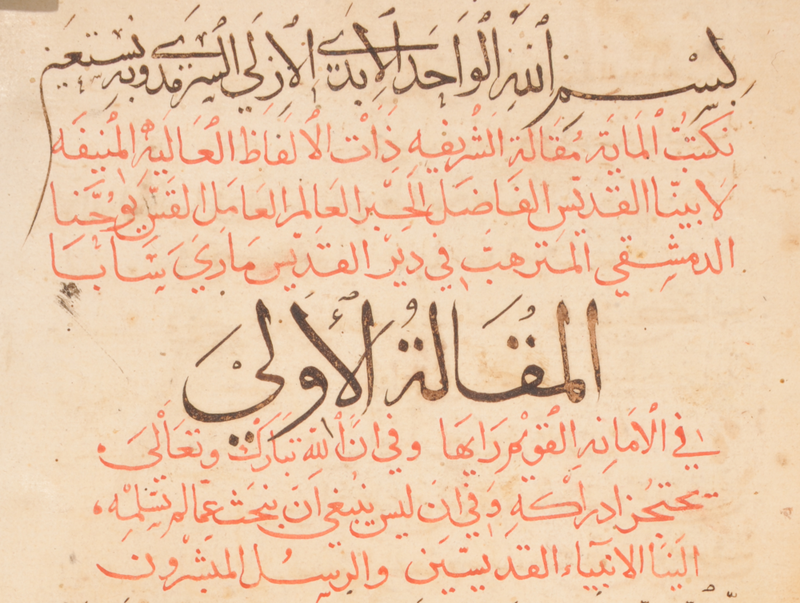 John of Damascus, Arabic. A late copy (19th cent. 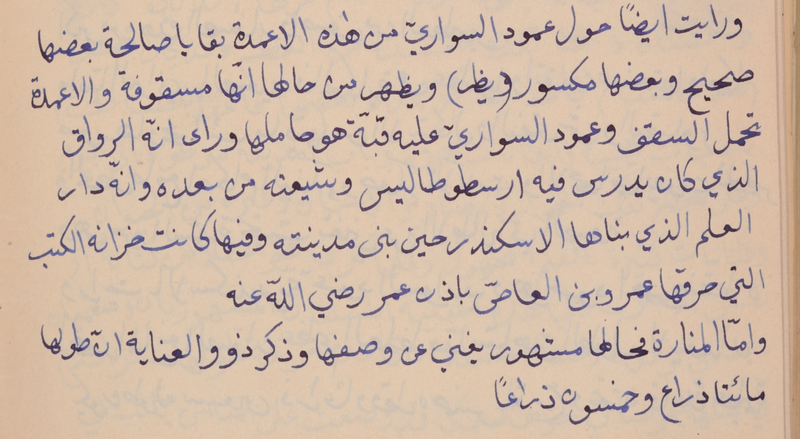 ), but with a fine hand, of the Kitāb fiqh al-luġa, by Abū Manṣūr ʿAbd al-Malik b. Muḥammad al-Ṯaʿālibī, a classified dictionary: e.g. § 17 animals (82), § 23 clothing (155), § 24 food (173), § 28 plants (205), § 29 Arabic and Persian (207, fīmā yaǧrá maǧrá al-muwāzana bayna al-ʿarabīya wa-‘l-fārisīya). For at least some of the contents, cf. the Syriac Palladius, as indicated below. 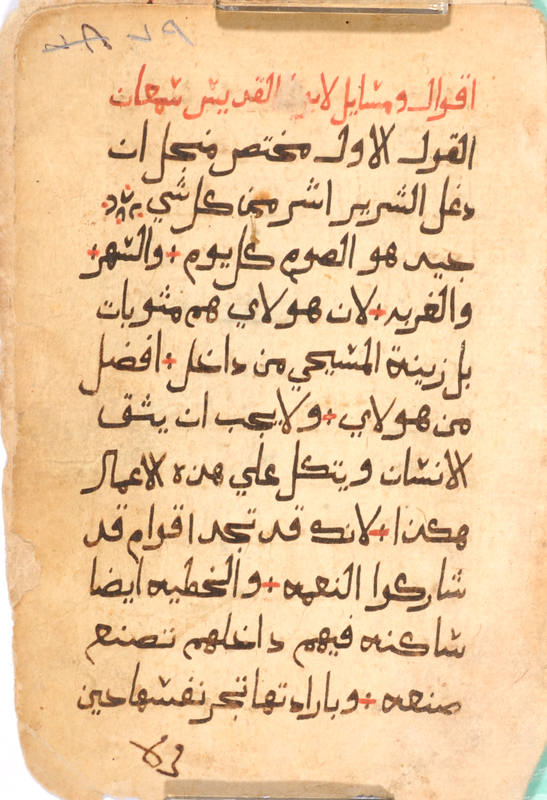 Arabic, 15th century (?). Second, but probably contemporaneous with the first, scribe begins at 80r. Two loose folios of an Arabic tafsīr of the Gospels, one of which has the quire marker for the original thirty-first quire (so numbered with Syriac letters). Perhaps 16th cent. From Mt 10, with commentary (qāla ‘l-mufassir), on 1v (image below); Lk 6:20 ff. on f. 2r. MBM 367, f. 1v. Mt 10:19-23 with the beginning of the commentary. Garšūnī (very nice, clear script). Memre and other texts on theological, monastic, and spiritual subjects. 17th cent., Garšūnī, hagiography. Note the Qartmin trilogy beginning on 105v. 17th cent., ES Garšūnī, mostly hagiography. Colophon on 135v. 17th cent., WS Garšūnī, some folios missing, hagiographic, homiletic, &c.
Ecclesiasticus, Garšūnī, with some Turkish-Arabic/Garsh equivalents at beginning. MBM 469, f. 1v. Turkish words with Arabic/Garšūnī equivalents. Note that for the forms of aramak [to search], the third person forms are past indefinite, while the first and second person forms are past definite. From a Gospel lectionary, Syriac, Estrangela. Here is f. 6v, with Mt 18:15-17, 20:1-3. MBM 485, f. 6v. Mt 18:15-17, 20:1-3. French drama translated into Syriac by Abraham ʿIso in Baghdad, 1972-1974. MBM 489, f. 74r = p. 125. Title page to the Syriac translation of Corneille’s Le Cid. 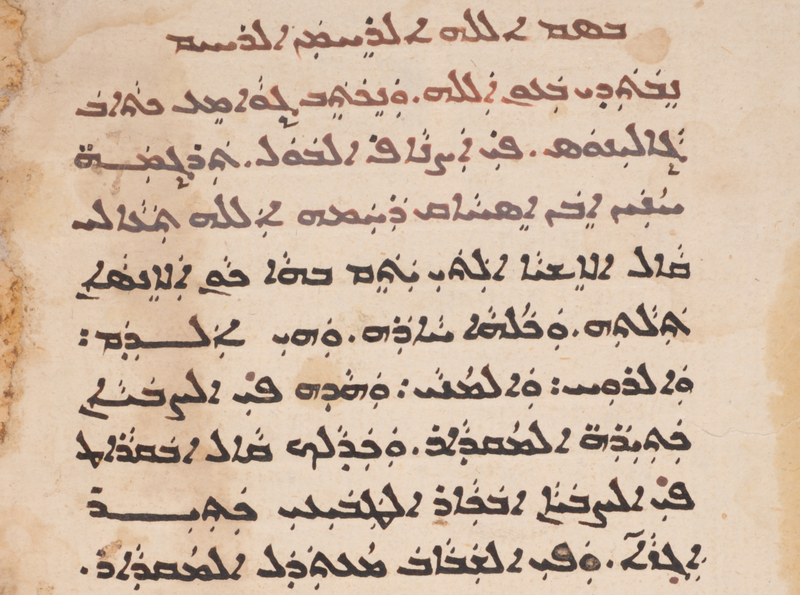 With the first page of the Syriac Le Cid cf. the original text here. 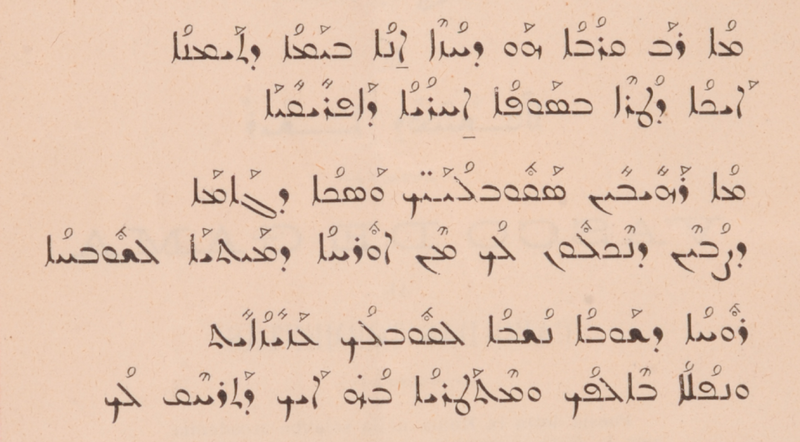 Note that the Syriac translation is in rhyming couplets like the French. MBM 489, f. 77r = p. 131. The beginning of the Syriac Le Cid. 19th cent., Arabic. 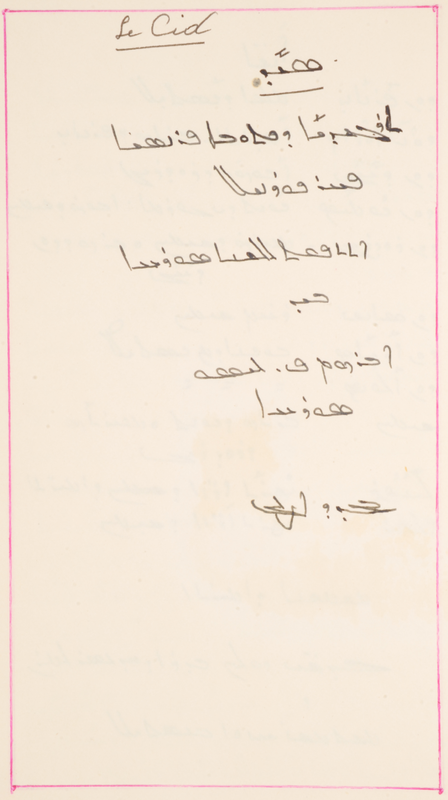 ʿAbd al-Laṭīf al-Baġdādī. Starts with excerpt from Ibn Abī Uṣaybiʿa on him (cf. the end of the ms). On 14r begins the K. al-Ifāda wa-‘l-iʿtibār fī ‘l-umūr wa-‘l-mušāhada wa-‘l-ḥawādiṯ al-muʿāyana bi-arḍ Miṣr. See De Sacy’s annotated FT here. Here is the part from ch. 4, on monuments (beg. 30r), about the burning of the library of Alexandria by ʿAmr b. al-ʿĀṣ “with the permission of ʿUmar” and on the Pharos of Alex (bottom of 34v = de Sacy p. 183). Printed work. Mariano Ugolini. Vasco de Gama al Cabo das Tormentas, dodecasillabi siriaci con versione italiana. Rome, Tipografia Poliglotta, 1898. 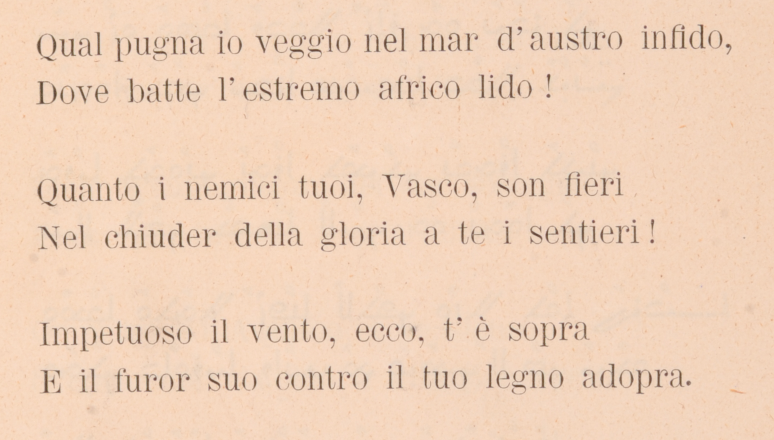 “Poesia letta in Roma nella solenne accademia per le feste centenarie della scoperta delle Indie, il giorno 21 Maggio 1898.” 6 pages. Bound with Rahmani’s Testamentum Domini. For some time now it has been exciting to watch the progress of digitizing and sharing manuscripts in major collections (BL, BAV, BnF, &c.). Staff at the British Library have provided a lasting service to readers not only by photographing and freely sharing their Greek manuscripts, but also by writing regular blog posts on specific digitized manuscripts at the Medieval manuscripts blog. (See also the Asian and African studies blog for other manuscript highlights.) These posts give a quick survey of what’s available, along with a few example images. Of course, if you’re looking for a specific manuscript, you can search for it, but these posts are a great way to stumble upon new things. So for those who might want to peruse any or all of these several posts on digitized Greek manuscripts by the BL staff, here are links for them all in one place, arranged by date from most to least recent. A hearty thanks to the BL and the sponsors of this project! The study of spoken and (ancient) written languages intersect perhaps less than might be desirable, but sic semper erat, sic semper erit. Nevertheless, I would like to take a cue from Olle Linge’s Hacking Chinese (http://challenges.hackingchinese.com/) and suggest an intentional, focused reading effort for ancient language students. The value of a reference work is its capacity to furnish facts quickly, and a good reference work must be a well-ordered affair. But the quickness with which these facts are appropriated depends in large part on the skill of the user. And this skill results only from diligent practice. It is not enough to know about a book of reference; one must handle it, thumb the pages, know where the index is, know what sort of information it gives. You are not qualified for research unless you can locate the facts that are available quickly. He has the 辭海 cí hăi in mind, here as a reference work for students of Chinese history, but his advice is equally applicable to textual experience in a language, or philological experience. Coptic. “Marina” (pp. 27-33) and “Siebenschläfer” (pp. 21–24) in W. Till, Koptische Heiligen- Und Martyrerlegenden: Texte, Übersetzungen Und Indices, vol. 1, Orientalia Christiana Analecta 102 (Rome: Pont. Institutum Orientalium Studiorum, 1935); volumes available here. Further on this story in Coptic, see here from my hagiography bibliography. Georgian. The five texts on David & Constantine in I. Abuladze and E. Gabidzashvili, ძველი ქართული აგიოგრაფიული ლიტერატურის ძეგლები, წიგნი IV სვინაქსარული რედაქციები (XI-XVIII სს.) (Monuments of Old Georgian Hagiographic Literature, Vol. 4, Synaxarion Redactions, [11th-18th Centuries]) (Tbilisi, 1968), 359-366; and the Parable of the Man & Elephant in the two versions of Barlaam and Ioasaph. Old Turkic/Uyghur. The text on p. 53 of W. Bang, “Türkische Bruchstücke einer Nestorianischen Georgspassion,” Le Muséon 39 (1926): 41–75 (cf. Gabain, Gr., p. 264); and the text in P. Zieme, “Ein uigurisches Sündenbekenntnis,” Acta Orientalia Academiae Scientiarum Hungaricae 32 (1969): 107-121. If you like, share what you plan to read in the comments below. And any thoughts on this enterprise generally are welcome, too. Happy studying!